Online multiplayer for Arma 2 and Arma 2: Free has stopped working on May 31, 2014 due to GameSpy services being shut down. Use Master Server Browser. SecuROM DRM. Removed in Patch v1.05. Combined Operations includes both Arma 2 and Arma 2: Operation Arrowhead; some mods (e.g. DayZ) require both games. Product keys for Arma 2, Arma 2: Operation Arrowhead and digital versions of Arma 2: Combined Operations optionally activate on Steam. Requires both Arma 2 and Arma 2: Operation Arrowhead. Digital distribution versions are already patched; for other versions use the patches below. 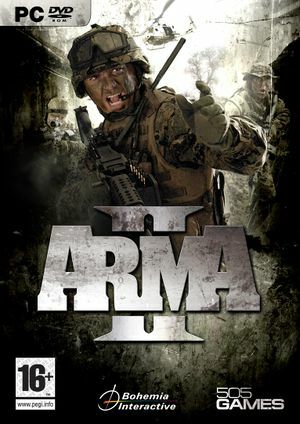 Arma 2: Patch v1.62 (requires Patch v1.60). The game has a selection of pre and post process AA. Multiplayer servers can optionally use BattlEye anti-cheat protection. Only Operation Arrowhead on Steam has a working server browser; for Arma 2 and non-Steam Operation Arrowhead use Master Server Browser. 128 Server browser only works for Operation Arrowhead on Steam. Change refresh=60; to the desired refresh rate. Set Default Communication Device and Default Device to the same device. Set the 3D resolution and the interface resolution to exactly the same value. The value isn't as important, because no matter what, if the numbers don't equal, there will be performance loss. Ideally, both values would be set at 100. Set Video Memory to "Default". By default (confusing, but keep reading), Arma II will cap the VRAM at an unspecified value. This value is actually lower than the "Default" option in the settings, but will still be named "Default". Texture Quality is dependent on the amount of RAM in your system, but due to the tweak above, it is safe to set the option to higher values. 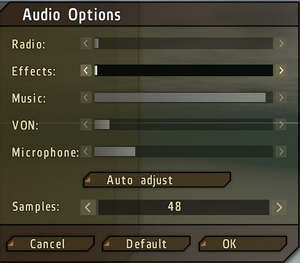 For a higher frame rate and reduced input latency, turn off the fancy options, like smoothing and head bobbing. To turn off motion blur, either download this mod or set post processing settings to "Very Low". This does speed up camera movement, so experiment to your liking. 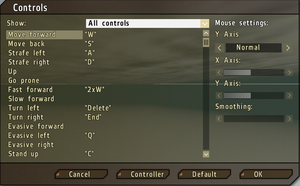 you can also use your Nvidia Control Panel as shown here to increase you frame rate. For faster rendering, turn on PPAA instead of the normal AA (Anti-Aliasing). ↑ 1.0 1.1 File/folder structure within this directory reflects the path(s) listed for Windows and/or Steam game data (use Wine regedit to access Windows registry paths). Games with Steam Cloud support may store data in ~/.steam/steam/userdata/<user-id>/33900/ in addition to or instead of this directory. The app ID (33900) may differ in some cases. Treat backslashes as forward slashes. See the glossary page for details.